Why don't I see the option to mark a question as a duplicate? Below is a screenshot (external mirror) of what I see when I try to flag this question. Why don't I see the "it is a duplicate" option? After some additional troubleshooting, I have discovered that I do see the "duplicate" option when I try to flag questions on Meta Stack Overflow. However, I do not see the option on Stack Overflow, Ask Ubuntu, or Meta Ask Ubuntu. I just received the flag privilege on Stack Overflow today, but I have had it for several days on Ask Ubuntu and Meta Ask Ubuntu. You don't see it because flagging a question as a duplicate automatically creates a "possible duplicate" comment, and you do not have enough rep (50) to earn the "comment everywhere" privilege. You're also missing the off topic options from the flag dialog for the same reason. This was put in place to address a 404 bug. You do have the option here on MSO because the required rep for commenting everywhere is 1, meaning everyone has the privilege. If someone here with 20k+ would edit the flagging privilege wiki and add a remark about this, that would be super. I'm unsure of the editing process for these pages and am having trouble tracking down current information, but the flagging privilege page could use an update to address this. Not the answer you're looking for? 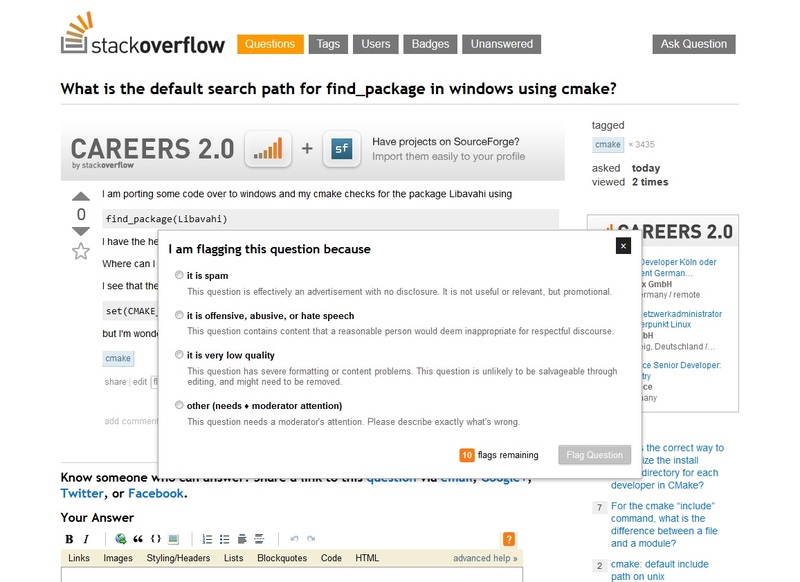 Browse other questions tagged support flags user-interface . Where on earth is the “mark duplicate” UI? How can we edit the “Flag Posts” help page to indicate that users gain the ability to flag to close at 50 rep? How do I use the “Requires Moderator attention” option? What is considered “hate speech”? How should I flag an answer in Spanish? Why don't we treat rubbish the same as spam? When and why was the “offensive” flag renamed?